Our Quartet was formed in August 2001 in Newlyn, Cornwall. 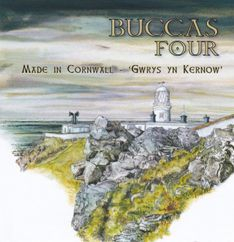 Buccas being a name used in days gone by for people from Newlyn, like Hakes were people from St.Ives. We have achieved first place in a number of festivals in the past eg. Camborne Music Festival and Cornwall Music Festival in Truro, gaining Distinction and Honours markings. We have given concerts in such places as Concarneau in Brittany, Southern Ireland, and many counties in England. We have also appeared on National Television and Local radio. Most of our venues are naturally in Cornwall but we are prepared to travel further for special events. We have a varied repertoire so as to please as large an audience as possible. For bookings please see our Contacts Page. at the reduced price of £5 if bought with the new CD, on it's own £10.